Some regular readers might remember that in my retirement planning, I estimate that I will be able to allocate my capital at yields between 3- 4% and dividend growth between 6 – 7%. 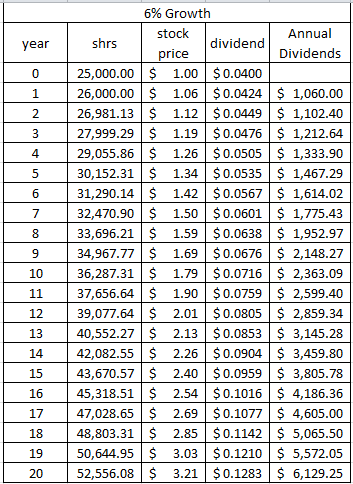 If I am lucky, the above numbers will result in roughly doubling of dividend income every seven years or so. This means that if I had a dividend portfolio that generated $1000 in annual dividend income today, I could reasonably expect that through meticulous and opportunistic reinvestment of dividends and through the power of dividend growth, I will be able to double this to $2000/year in seven years. In order to generate $1000 in annual dividends, one needs anywhere from $40,000 invested at 2.50% to $25,000 invested at an yield of 4%. Of course, in a somewhat efficient marketplace for common stocks, investors who require higher current yields today tend to forego some of the expected dividend growth. On the other hand, some are fine sacrificing some current yield today, in order to capture estimated dividend growth in the future. As discussed previously, there is a trade-off between dividend yield and dividend growth. The balance is determined based on investors reasonable expectations against the realities of opportunities available at the time. I buy dividend growth stocks, because I want to earn dividend income that grows over time. When this annual rate of dividend growth is above the annual rate of inflation, this means that I have maintained purchasing power of my income. However, I have heard arguments that one could maintain the purchasing power of their dividend income, provided they reinvested the dividend back into securities that pay high dividend yields. Therefore, if you own a stock yielding 4% that never increases dividends, but you reinvest dividends at same or other security yielding 4% at the moment, your income will increase by 4% for the year. If inflation is below 4%, you would have essentially slightly increased purchasing power. I compared three scenarios of dividend reinvestment, over a period of 20 years. The basic inputs in each scenario is that an initial amount of $25,000 is invested in dividend paying stocks, yielding 4% in year 0. Starting prices are $1/share, which are adjusted for growth of dividends annually. Dividends are reinvested into more shares in the year they are received, at the price available at year end. For the purposes of illustration, I am assuming that company A never raises dividends, and stock price is always at $1, while the annual dividend is always at 4 cents/share. For company B, the assumptions are 6% in annual growth in stock prices and dividends. I wanted to compare these three scenarios, in order to illustrate the point that dividend growth is pretty valuable. For the investor in company A, they earned $1000 in year one. After 20 years of reinvesting dividends, the amount of annual dividend income is almost $2107/year. For the investor in company B their annual dividend income increased from $1060 in year one to $6129/year by year 20. 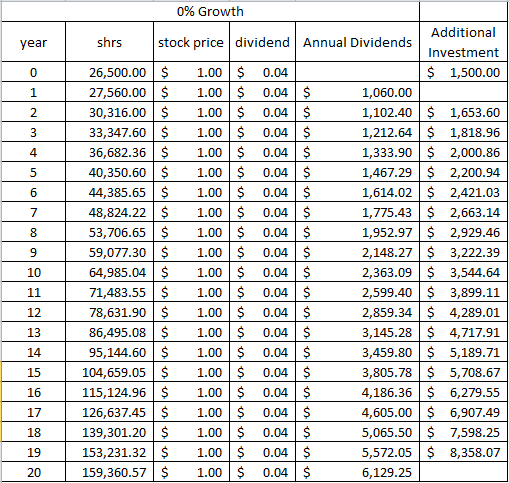 It is obvious that dividend growth investor in company B managed to earn more over time. In fact, the only way that the investor in company A could have kept up with the dividend income for investor B was by actually contributing additional capital. 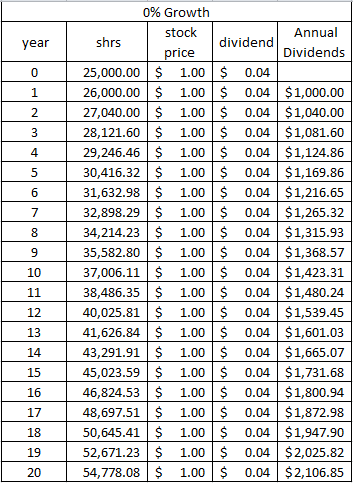 In the table below, I am going to show how valuable dividend growth could be for the individual investor. Therefore in year one, the investor in company A should have put $1500 towards additional share purchases, just so they could earn $1060 in annual dividend income. The investor in company A should have put money in additional purchases, simply to keep up with the growth in annual dividend income for investor B in company B. He or she (A) is putting more to work than in year 1, because investor B not only earns the same 4% yield, but their dividend income per share goes up by 6%/year. It seems that over the next 20 years, the investor in company A needs to put $76,902 in additional capital, merely to keep up with dividend income generated by company B. It is important to realize that dividend growth is an important tool in your arsenal of achieving financial freedom. Dividend growth is a result of the internal economic engine that allows companies you invest in to earn more and pay you higher dividends over time. Without any further effort on your part, dividend growth companies do most of the heavy lifting in your pursuit of financial independence. You are leveraging the hard work and capital allocation of the employees of these compounding machines, and generating the earnings fuel to generate dividend growth. By investing in dividend growth stocks, you are essentially making your money work for you, rather than the other way around. The added bonus of course is that companies that earn more and pay more in dividends over time, tend to also become more valuable as well. Therefore, whenever I consider between companies with high yields today with low or minimal growth today and higher dividend growth companies, I always choose the latter. At some point, even the juiciest yield today is not worth it to a long-term investor such as myself, in comparison to a company with steady dividend growth.